I've thought about this for a while now and finally decided that the new year is a perfect opportunity to start posting a Drink Of The Week (DOTW). Since I just barely made it for the first week of the year, I have not yet decided on the timing for DOTW posts. It makes sense to post before the weekend—like on a Thursday—but as soon as Friday hits, we will be into our second week of the year, so it will actually be the Drink Of Last Week. On the other hand, most people think of the week as starting on a Sunday which completely misses the weekend, and in Minnesota at least, you can't even buy booze on Sunday! So we will start this off on Thursdays and see how it goes. My goal with DOTW is to go through a basic drink recipe, showing you how to best prepare the cocktail. Recipes may come from a variety of sources, including books both new and old, bars or restaurants that have divulged their secrets, or even original cocktails that I create. 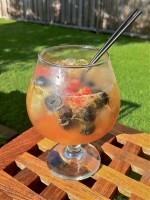 I want to show you drinks that I enjoy and that I know you can prepare. They should not have ingredients that are impossible to find or create yourself. If they include homemade items, I will refer to previous posts with instructions, or write additional articles ahead of time in anticipation of using them for a Drink Of The Week. I also want to encourage you to speak up in the comments. Is there an ingredient you have had trouble locating? Perhaps you found a good deal somewhere that you can share with others. Maybe you want me to feature or interpret one of your favorites. Speak up! So, without further ado. . .
Now, I know what you are going to say: "But it's the 21st century!" Of course it is. In fact, it has been for over a decade. So, if you want that cocktail you are welcome to try it. It's a creation by Jim Meehan of PDT in New York and it appears in the book The Essential Bartender's Guide by Robert Hess. With all of the possible cocktails to choose from, I thought I should begin with a classic, and the 20th Century seemed appropriate given the new year. It's actually a cocktail from 1939 that was created to commemorate the new engine that began pulling the Twentieth Century Limited passenger train that connected New York with Chicago. Carefully measure all ingredients and pour them into a cocktail shaker. Add plenty of ice, seal, and shake until chilled. Strain into a chilled cocktail glass and garnish with a lemon twist. Yes, it's a gin drink—but don't turn your back on this! The beauty of gin, as you will discover if you don't normally enjoy it, is that the juniper which seems to offend some people actually melds with the other flavors in a cocktail. Taken alone, some might not always like what gin offers, but in a mixed drink it elevates the other ingredients. It takes the flavor profile to a level that could never be possible with vodka. No, you are not going to taste pine needles. It might be time to open your mind a little if you are not a gin drinker and maybe even set a New Year's resolution. But don't take my word for it—let your taste buds decide. 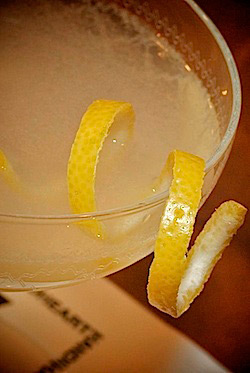 The second ingredient, Lillet Blanc, is a fortified white wine aperitif with subtle sweetness and a hint of orange peel. It can usually be found among the dry vermouths, but I wouldn't really say it tastes like them. Lillet also comes in red form. You want the Blanc which appears often in recipes. It used to be difficult to locate, but thanks to the growing popularity of classic mixology (and a recent James Bond film that featured his Vesper Martini) it's very easy to find these days. Crème de cacao is a cocoa liqueur that provides the sweetness in this cocktail. There are light and dark varieties. I recommend getting the light. There are many brands, and it's not expensive, so any will do. Cacao is actually the name of the tree that bears the fruit which contains the seed pods that, once properly processed, can be turned into chocolate! The word cocoa was a transposition misspelling which is why there is so much confusion about how to say the dessert versus the plant itself. Get yourself some of this liqueur and it will probably last a very long time. Finally, always use fresh-squeezed lemon juice. Honestly, how hard is it to slice a lemon and squeeze out some juice? Sure, lemons can get expensive, but they are never that much, and they are always easy to find. Besides, this is how the cocktail was meant to be made and the flavor will definitely suffer if you don't use fresh ingredients. While lemon and chocolate is not unheard of by chocolatiers, I wouldn't describe this drink as lemony chocolate. It is tart and refreshing with an unusual finish that you must experience to understand. The cacao is subtle. After you try this cocktail, you may decide you want to tweak the proportions. You should taste just a hint of the cacao after each sip—not so much that it dominates the drink. Enjoy it, and hold up your glass to a tasty new year! The 20th Century is a yummy, cocktail Randy! I tested this out with a professed "non-appreciator" of hard liquor, and she bellied up for more. I ended up adding a 1/4 oz more of the Creme de Cacao on my second round, as I was not getting the hint of the flavor on the first one. Now, I need lessons on garnishes...my lemon twists look NOTHING like yours. 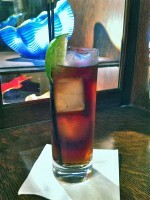 Changing people's perception of a good drink happens one cocktail at a time! This one is an excellent "gateway" and illustrates that tasting it is important, since you never really know how sour your lemon might be. As for the garnish, as long as you are getting some nice lemon oil spray on the surface, your twist doesn't have to look perfect. Still, I will followup with a post soon about garnishes. It's a huge topic, so perhaps I'll focus on the twist to start out. I'd just about given up on the 20th Century, but an evening at Drink in Boston has shown that there is hope. Two changes: Cocchi Americano for Lillet adds a little bitterness for balance -- probably closer to old Kina Lillet anyway! 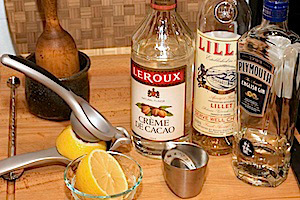 Second, they use Brizzard creme de cacao, where I used Leroux (I think); the Brizzard is far more harmonious, where my bottle tends to dominate the drink. Good comments. This was over a year ago now that I posted the 20th Century, and I didn't have Cocchi Americano at that that time, but I do now. Probably worth a re-visit. Also, could you not reduce the amount of Leroux to compensate for differences? I think that speaks to the point of tasting your recipes when you make them, which is always a good idea anyway. You can zero in on your own proportions that work best with your ingredients. I'll definitely give the Cocchi a try! While one could reduce the creme de cacao to restore balance, it's not necessarily that simple. The drink needs to balance sweet-sour, sweet-bitter, and also get the hint of chocolate in the finish; I suspect that the wrong cacao used in excess leaves you too sweet and, if you dial it back enough to restore that balance, you don't have enough chocolate to notice. And one point that's not obvious from writing about the 20th Century -- not a specific criticism here as it's a general fault -- is that I think the cacao should only be noticeable in the finish. Good point about balance, but when you said your cacao dominates, I took that to mean too much cacao. Dialing it back would obviously leave you with less sweet, but you could compensate with simple syrup! Ok, that's taking it a bit far, but if you only like to taste the chocolate on the finish, you probably need to split hairs when it comes to ingredients. I guess I can enjoy this drink with a little more chocolate, but I totally understand where you are coming from. And for others reading this, balance, flavor nuances, hints of chocolate on the finish--these aspects are what it's is all about. Enjoy a tasty drink, but don't be afraid of the details either. It's an art AND a science. You have Cocchi Americano now? May I ask where you found it, or did you order it online? I asked the good people at Thomas Liquors a couple months ago, and they said they can't get it. That seems odd since they carry the other products imported by Haus Alpenz. 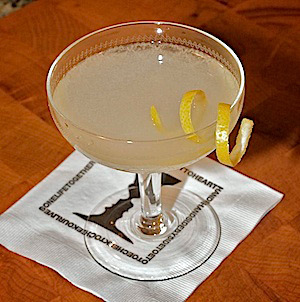 I *love* the 20th Century Cocktail, as well as the Corpse Reviver #2, and would like to try them with Cocchi Americano. Greco, Peter at Thomas Liquor has been pretty helpful. I especially like that they stock Carpano Antica—a MUST-have item in my opinion. In fact, I have given him my wish list a few times over the past year and he had added items to the shelves that I appreciate. Amaro Nonino, for example, is available there, but I don't recall seeing it anywhere else. As for Cocchi, I got mine from DrinkUpNY.com which will ship for free if you order more than $99. It's easy to reach that mark when you need Templeton Rye and Ransom Old Tom Gin. Speaking of Haus Alpenz, I talked to a bartender in Portland a few days ago who met with them and said they were going to start importing Cocchi vermouth, which apparently has the same full body and flavor as Carpano, only cheaper and a smaller bottle (I'd rather have good vermouth in something smaller than Carpano's 1 liter). All we can do is keep asking/pressing the store managers and buyers to get this stuff. I too am surprised about Cocchi given Haus Alpenz is local. I got Cocchi at Fresh Pond in Cambridge. Tasted Cocchi sweet vermouth last night--fantastic! Bold and delicious like Carpano Antica, but not quite as complex which will work great in so many cocktails. Thanks for responding, Randy. I guess I'll have to put in that online order for Cocchi Americano. Another one I can't seem to find in the metro area is Bols Genever. I've been keeping my eye out for that since last summer, and don't see it anywhere. Maybe I'll order that Ransom Old Tom Gin too. I've heard that's an interesting product. And yes, I picked up a bottle of Carpano Anitica at Thomas Liquors this winter. Very interesting vermouth. I like it in rich cocktails like the Negroni and Bijou. Really transforms those drinks. But it doesn't work in everything, or not at normal levels. Made a Satan's Whiskers with it recently, and the Carpano really stood out in it, which didn't work. That's my favorite drink that uses orange juice, and if I try it again with Carpano, I will definitely cut back the amount. I've heard of the Cocchi sweet vermouth, but even if it's imported who's going to sell it around here? There's only so much space in a liquor store that they want to devote to vermouth, and it isn't much (and sadly, at least half that small space goes to Tribuno and Gallo). Would be cool if Morelli's would specialize in Italian vermouths in addition to selling booze real cheap, but I guess that isn't their thing. You could also try France44. They carry Carpano and a few other items I haven't seen elsewhere. But, Peter at Thomas has often said that if there is something specific you want, just let him know and he can order it. I don't see why he wouldn't be able to get some Cocchi Vermouth. He already confirmed he could get Cocchi Americano (and he might already have it on the shelf) since he definitely carries other items from the Haus Alpenz portfolio--so I don't see how this would be an issue. I have yet to find Bols Genever or Ransom at stores in MN, though I have requested both, which is exactly what led me to justify an order online. Add some Plymouth Sloe Gin and Cocchi Americano and you don't have to leave the house to get any of it. I'd rather throw business to local shops, but I don't want to pay shipping either, so it makes sense to just setup a decent-sized order when that's your only source for some of the items. I'm not sure who Peter is at Thomas Liquors. I dealt with the older guy with gray hair, and he said he couldn't get the Cocchi Americano after contacting their distributor. This was in early winter (late November/ early December). But they were able to special order Marie Brizard creme de menthe for me (I love Stingers). That's another item where you can only purchase bottom shelf stuff in the Twin Cities. Even at Surdyk's. France44 is a nice liquor store. I scoped it out last summer, and what I saw on their shelves closely matched what I found searching their website. I've been checking that site periodically for the past several months, but no Cocchi Americano. And Plymouth sloe gin. I forgot about that. That's another reason for me to make that internet order. I gotta do that before my Lillet goes bad...and that will be very soon I'm afraid.